I have loved the 4th of July ever since I was a kid. It was great having a day of celebration but my favorite part of Independence Day was always the food...well and the fireworks. I'll be honest, now that I'm older, and we live in an area where awesome fireworks are legal, they are what I look forward to the most. However a close second is still the food! I thought I would make a recipe that is not only festive, but is great for parties. 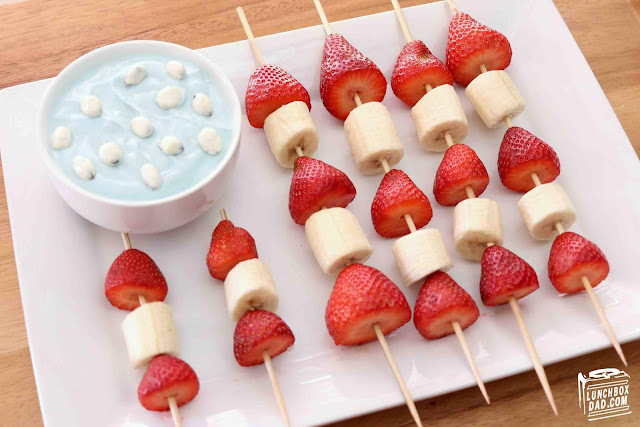 Check out my recipe video below for 4th of July Fruit Kabobs and Yogurt Dip to find out how to make this edible American flag for your next neighborhood get together! 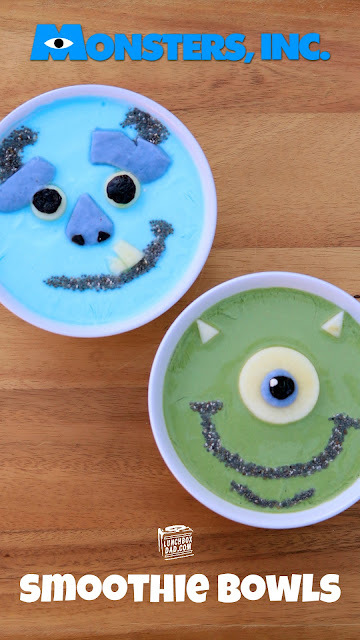 Monster's Inc. Sully and Mike Smoothie Bowls! Since it's summertime, and school's out, I thought it would be the perfect season to try to make some fun smoothie bowls. I've seen smoothie bowls all over Instagram but I have never made one. Of course we've made healthy smoothies before but they are pretty standard. I figured it was about time to up my game. Mike Wazowski and Sully from Monster's Inc. have been on my mind lately so I decided to make them my test subjects. These definitely weren't as easy as I thought they would be but they also weren't super difficult either. The hard part is making the faces quickly before the smoothie melts. So I recommend making the two smoothies first and then putting them in the freezer to stay thick and icy. Still interested? Here is how you make them. Ingredients: Yogurt, banana, ice, green matcha, blue matcha (thanks to match.blue for sending me some to try out), apples, chia seeds, dried cherries, cream cheese. 1. Blend ice, yogurt, peeled apple (or any other white fruit), and banana. The amount you put in really depends on how thick you want your smoothie so I would start out with a conservative amount and go from there. After it's blended, drop in some matcha. You will want to start with a little and then add more to get the desired color. 2. 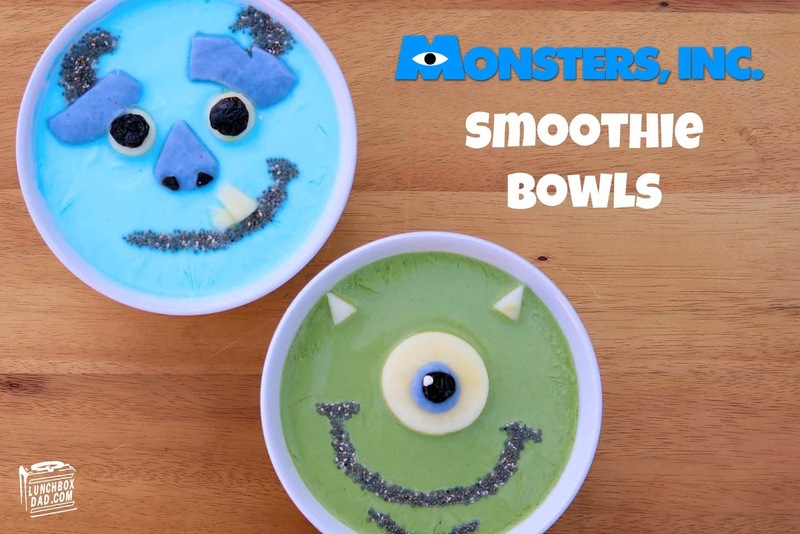 For Sully's eyebrows and nose, and Mike's eye, you will want to separate a small amount of smoothie and add more blue matcha to create a deeper color blue. Then, put some small globs on parchment paper on a cookie sheet, and stick in the freezer. This will help you create the facial features. Once the globs are frozen, proceed to the next step. 3. Pour smoothies into each bowl. Cut out Sully's frozen features and place them on his face. Sprinkle chia seeds on top for his mouth and horns. His teeth and white's of his eyes are apple. Finish Sully by placing a dried cherry on for each eye. Cut a few tiny cherry pieces out for his nostrils and put them in place. 4. To finish Mike, sprinkle chia seeds on top for his mouth and chin. The white of his eye and horns are made from apple. 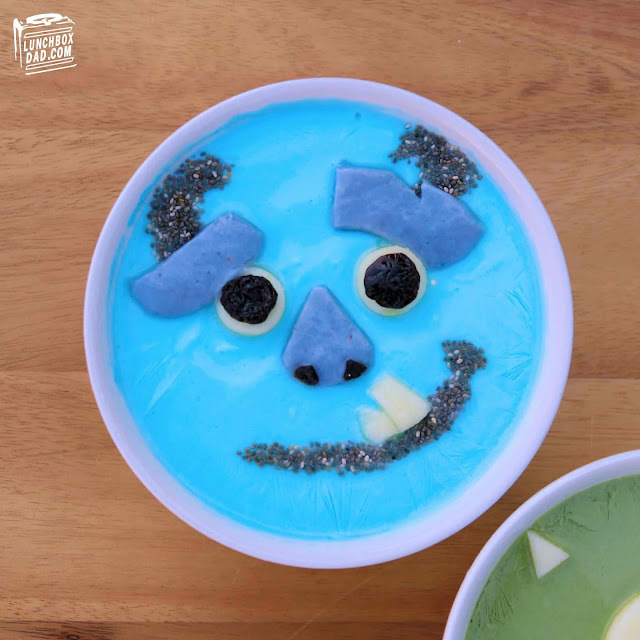 Place the frozen blue smoothie circle that you made earlier on top of the apple and then top with a dried cherry after that. Finish with a little drop of cream cheese on top of the cherry. As parents, we know that our car can quickly become a science experiment. 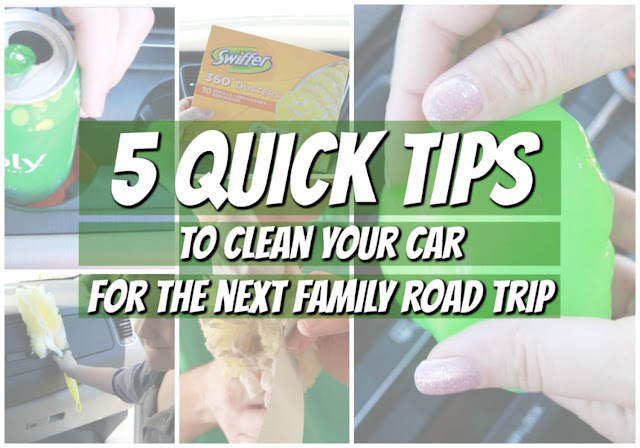 Whether it's carpooling to and from school, the fun drive on a holiday weekend, or the week long summer road trip, our family cars can get disgusting. If you are like me, I don't even want to look at what the backseat looks like, much less clean it up. This is where these cleaning tips come in. They don't take long to do and and your kids can even help out. As you can see from the video below, even my four-year-old loves using the Swiffer Duster! Speaking of which, you won't need many supplies or complicated steps to accomplish these. Just a few minutes and probably tools that you have laying around the house anyway. So watch our short video below and let me know what your favorite tips are!